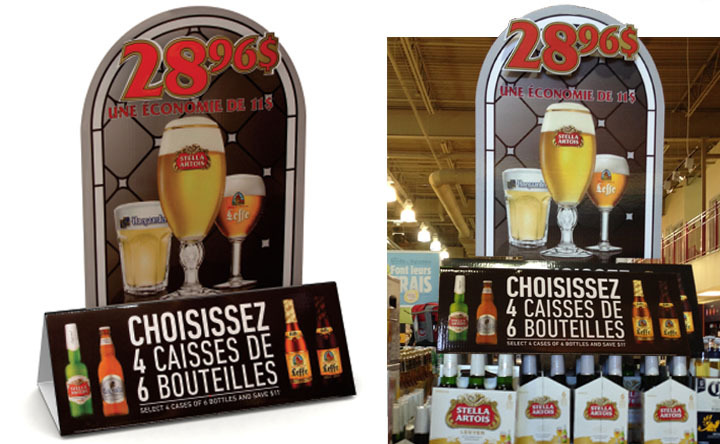 Conceive of an original stand-up promotional piece, uniquely creative so as to be noticed in a busy retail environment and that is easy to assemble at store level. Utilize textures and designs incorporating curves which are a drastic departure from the rectangular shapes generally associated with cases of beer, and to create a folding base to facilitate transport. This distinctive promotional piece is attractive and eye-catching due to its rounded shape and brings attention to the promotional message. The card is positioned in a triangular base which unfolds when positioned on the floor.